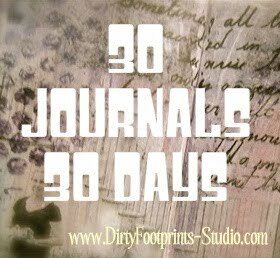 Connie over at Dirty Footprints studio is inviting art journalers to participate in a little interview. Thanks Connie for the opportunity! –How long have you been Art Journaling? Not long enough! Actually, I’m a rookie. I only started about 18 months ago and honestly, in that timespan, it’s only been an off and on process for me. However, just this past month, I made a commitment to myself to create a journal page once a day. Being a part of Kelly Kilmer’s class has helped whip me into shape and have accountability. I like the idea of having other artistic people participating alongside me, journaling and taking the journey with me. 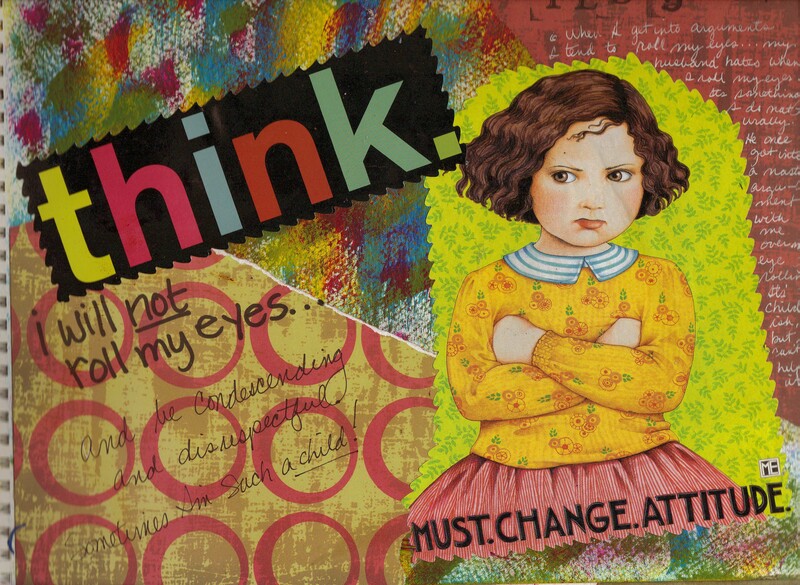 –How has Art Journaling impacted, changed, or enhanced your life? Journaling has been a way for me to ‘get my art on’ every day. I’ve been searching for a way to exercise my creativity so I can allow it to grow and blossom into something really meaningful. 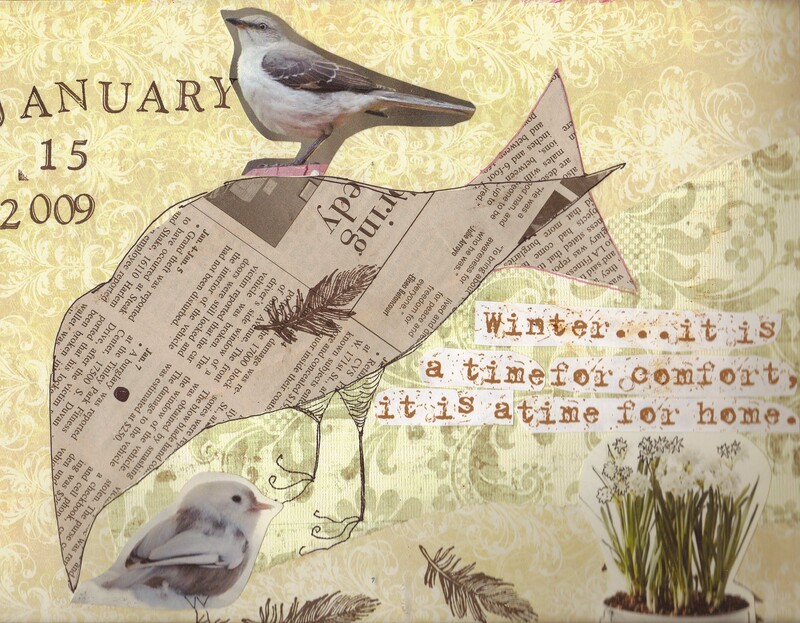 By journaling, I can express myself on a more personal level, letting it flow through me and out onto the page. I can honestly say it’s very much like expensive art therapy. What is so brilliant about art journaling is it can take as little or as long as I want to create a page and document my feelings. A journal page doesn’t have to be an enormous time commitment if I don’t have a lot of time during the course of a day. I also really enjoy using journal prompts that cause me to think. I can explore things about myself I never really considered. It’s fun to look inward and see what kinds of things I like, remember or have opinions about. –What are a few of your favorite Art Journaling materials to use? I like to keep it simple. My favorite art supplies are watercolor pencils in conjunction with Prismacolor brand colored pencils, white opaque gel pens, black fine point Sharpies, Avery permanent glue stick, wall paper sample books (I got really lucky…I have over 30 books all discontinued and free from my local wallpaper/paint store!) for all the unusual background pages they contain and focal images, rubber stamps and magazine clippings. . . I also want to try black gesso as a base, I think that might be fun and open up some new art joy for me! My favorite journals to use are Moleskine watercolor sketchbooks (I save a bundle by picking them up at Borders when they issue a 40% off coupon; I stock up!) I also use watercolor spiral bound pads, too. The watercolor paper holds up so much better than regular paper…which tends to ripple and bubble up when painted on. –Who are some of your favorite Art Journalers? I like Teesha Moore and Pam Garrison, Aimee Dolich for her lettering style (which is an art in itself), and Kelly Kilmer for her use of images and painted backgrounds. I enjoy Effy Wild for her honesty and earthiness. To be perfectly honest, I really do try not to look at too many other journaler’s work and be too influenced by anyone’s style. When I see the work of other artists, especially if I find the work to be amazing, instead of enjoying the imagery, it tends to deflate me. I don’t want the influence of others to adulterate my own style (which is emerging). I think because art journaling is so deeply personal, it should be treated as such and not ‘judged’ as regular art would be. –What kind words of encouragement would you say to an Art Journal newbie? 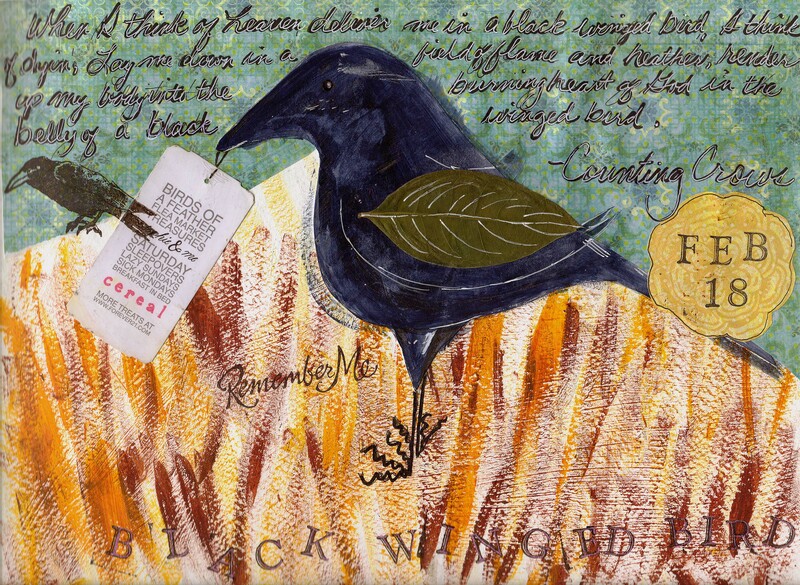 Use art journaling to completely express yourself, to exercise your art skills, to experiment, and as a place to let the good and bad flow out of you. Use it for what it was originally intended to be-art therapy for the soul. Don’t let other’s art and style intimidate you. 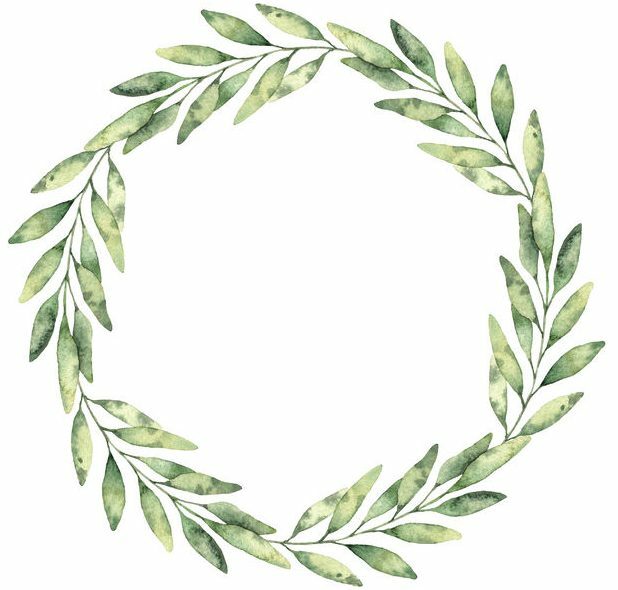 Practice daily, and suddenly you will begin to notice your personal symbols emerge and a style that is all your own. Revel in it. –Where can we contact you…give us some link LOVE!! I am a 47 year old, happy gal who happens to be an artist/writer, doll designer, wife, mother of 5, a dog lover, cat collector (I have 5), city girl and a Chicago Cubs fan. I hold a Bachelor of Fine Arts degree from Columbia College, Chicago. I aspire to one day be a prolific painter and drive a VW Beetle with a daisy poking out from the dashboard. Currently, I’m toying with the idea of getting my masters in Studio Art. I just might do it. Fabulous post Emily-great advice! I’m thrilled to hear how much you are enjoying yourself! Hi Emily! Art journaling is something that I have wanted to try for a long time, but I just haven’t made the time for it yet. I love your black bird page. I always enjoy your blog posts – they’re so thoughtful and interesting. Good luck with the journaling! Beautiful!! So have you braved the canvas yet??!! Lovely interview! Your pages are gorgeous! Hello Emily! I just loved the Counting Crows page. Hi Emily, Lovely interview! I loved your counting crows page~ I have often wanted to take one of Kelly’s classes, you might have inspired me to do so!